Introduction Effective triage of patients with emergent large vessel occlusion (ELVO) to endovascular therapy capable centers may decrease time to treatment and improve outcome for these patients. Here we performed a derivation study to evaluate the accuracy of a portable, non-invasive, and easy to use severe stroke detector. Methods The volumetric impedance phase shift spectroscopy (VIPS) device was used to assign a bioimpedance asymmetry score to 248 subjects across three cohorts, including 41 subjects presenting as acute stroke codes at a major comprehensive stroke center (CSC), 79 healthy volunteers, and 128 patients presenting to CSCs with a wide variety of brain pathology including additional stroke codes. Diagnostic parameters were calculated for the ability of the device to discern (1) severe stroke from minor stroke and (2) severe stroke from all other subjects. Patients with intracranial hardware were excluded from the analysis. Results The VIPS device was able to differentiate severe stroke from minor strokes with a sensitivity of 93% (95% CI 83 to 98), specificity of 92% (95% CI 75 to 99), and an area under the curve (AUC) of 0.93 (95% CI 0.85 to 0.97). The device was able to differentiate severe stroke from all other subjects with a sensitivity of 93% (95% CI 83 to 98), specificity of 87% (95% CI 81 to 92), and an AUC of 0.95 (95% CI 0.89 to 0.96). Conclusion The VIPS device is a portable, non-invasive, and easy to use tool that may aid in the detection of severe stroke, including ELVO, with a sensitivity of 93% and specificity of 92% in this derivation study. This device has the potential to improve the triage of patients suffering severe stroke. Prehospital triage of patients suffering myocardial infarction (MI) to centers capable of performing percutaneous intervention posed similar challenges in the 1990s. Portable ECG with focus on ST elevation as a predictor of MI became the major prehospital diagnostic tool with a sensitivity of 69% and a specificity of 81%.12 This test must be performed and results sent to interventional capable hospitals within 10 minutes of emergency personnel arrival on the scene. A technology that could achieve similar speed, sensitivity, and specificity for ELVO would have the potential to likewise improve the rapidity of care for stroke. The volumetric impedance phase shift spectroscopy (VIPS) device (Cerebrotech Medical Systems, Pleasanton, California, USA) experienced initial positive findings with a pilot study performed on stroke alerts at a single center, which demonstrated 86% sensitivity and 77% specificity for ELVO in that preliminary highly ELVO enriched cohort. Here we assessed the potential of the VIPS device to function as an easy to use, portable, fast, and safe non-invasive severe stroke detector across a broad group of diverse diagnoses, generated from the pilot cohort, the VIPS for the Non-Invasive Detection of Hemispheric Bioimpedance Asymmetry in Severe Brain Pathology (VITAL) cohort (a wide range of brain pathologies), and a cohort of normal controls. Prospective data for this analysis were gathered across three cohorts, including a single center pilot cohort, a cohort of healthy normal subjects, and the multicenter VITAL study. The pilot study was performed at a comprehensive stroke center (CSC) and consisted of patients presenting or transferred from a satellite hospital with symptoms consistent with acute ischemic stroke being evaluated for possible endovascular therapy. The initial analysis of the pilot population generated a sensitivity of 86% and a specificity of 77% for ELVO, which led to subsequent efforts to obtain data across a broader population, which is presented herein with this combined analysis. The healthy cohort consisted of normal volunteers who had no history of stroke, brain tumor, brain surgery, significant head trauma, or implanted medical devices in the head or neck, and had no metallic craniofacial implants. The VITAL study consisted of a diverse patient population presenting to one of five CSCs and undergoing neuroimaging for any brain pathology or neurologic presentation. In both the pilot study and the VITAL study, screening was performed on arrival to the main hospital by study coordinators in communication with the evaluating neurointerventionalist. Patients had to have neuroimaging within 30 minutes of the VIPS device reading. Patients were excluded if they were found to have implanted medical devices or metal in the head or neck. All patients enrolled in the pilot study and the VITAL study were scanned by a study coordinator or investigator after arrival at the hospital conducting the study. The study was approved by the institutional review board of each institution, and consent was obtained for all study subjects. VIPS is a non-invasive technology capable of detecting a bioimpedance signature across a bodily tissue. The VIPS device functions by transmitting an array of varying frequencies of low energy radio waves from each side of the back of the head to a receiver in the forehead portion of the visor. Radio waves of different frequencies are modified differently as they pass through the tissue, depending on the type and fluid properties of the tissue, producing a unique signature for varied brain pathologies. VIPS exploits the alterations in tissue electrical properties that occur as a result of fluid and electrolyte changes. For example, in a region of the brain that is ischemic due to an ELVO, arterial blood content is diminished and the distribution of fluids and electrolytes between the intracellular, extracellular, and intravascular spaces may be substantially shifted. These alterations result in a change in the tissue bioimpedance. Because acute stroke typically affects the hemispheres unequally, ELVO induces an asymmetry in the bioimpedance of the brain. The larger the fluid and electrolyte changes in the affected cerebral region (ie, the larger the stroke), the greater the bioimpedance asymmetry. 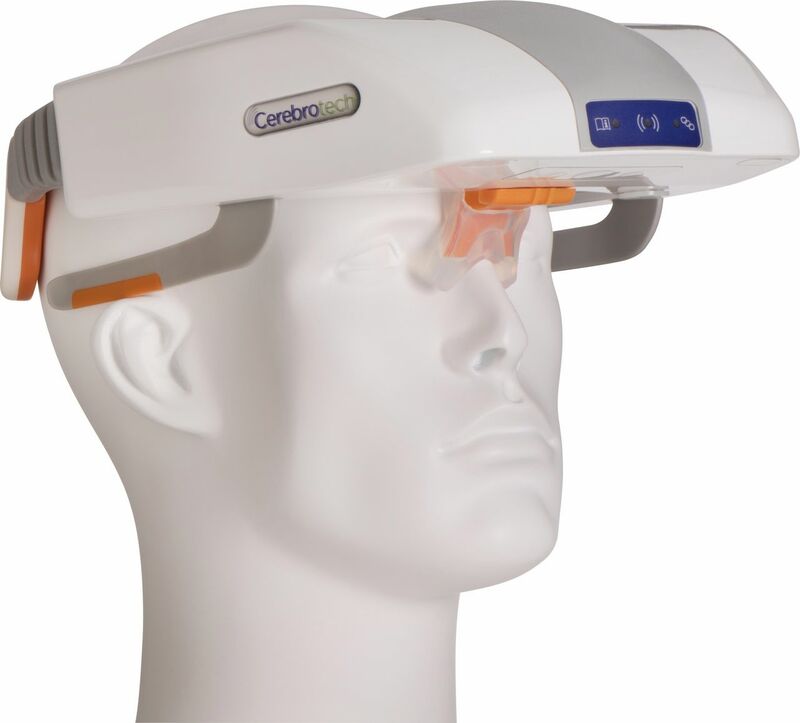 The VIPS device has two transmitters located toward the back of the head and biased to each side, and one receiver positioned in front of the forehead. This allows the device to measure the bioimpedance of each brain hemisphere separately, making it sensitive to asymmetries, such as those caused by an ELVO. It should be noted that there is not a specific, single bioimpedence asymmetry number that is generated by the technology, but rather bioimpedance values on each side across a spectrum of frequencies. This information is then analyzed with a proprietary algorithm to develop the final result that we refer to in this manuscript as ‘mean bioimpedence asymmetry’. The goal of this derivation study was to classify patients according to imaging and clinical criteria and then use those classifications to guide analysis of the raw dataset, using machine learning, to create the analysis algorithm that eventually provides the final mean bioimpedence asymmetry. The VIPS device is non-invasive and can be used when placed on the head, like a visor. The transmitter and receiver antennae are enclosed inside plastic housings and do not contact the subject. The radiated power has been tested and is extremely low: the power density is at least eight times lower than the safety limits set by the Federal Communications Commission and recognized by the US Food and Drug Administration (FDA). The device also meets all relevant requirements of the International Electrotechnical Commission general standard 61 601. The device is cleared by the FDA for distribution in the USA, and is CE marked for distribution in the European Union. Only study personnel applied the device. Device training was performed by Cerebrotech at each participating center and consisted of a short presentation followed by two mock device applications per study coordinator or investigator. The device is placed on the subject’s head, resting on the ears and forehead (figure 1). The device communicates with a laptop by Bluetooth. The operator then activates the device from the laptop. Each reading takes 5 s and three readings are performed. The results of the three readings are combined, and the entire scan takes about 30 s to complete. If the device is not able to acquire a sufficient reading due to poor positioning, instructions to repeat the testing appear. Device usage is demonstrated in the accompanying video (see online supplementary video 1). The volumetric impedance phase shift spectroscopy (VIPS) device. Prior to data analysis, a panel of experienced stroke physicians, including non-interventional stroke neurologists, interventional neurosurgeons and radiologists, and critical care neurologists, many of whom are part of Cerebrotech’s SAB, were surveyed by Cerebrotech to identify brain pathology subtypes that they agreed would merit severe stroke triage to a CSC and therefore receive the label ‘severe stroke.’ These neurological processes include ELVO (internal carotid artery (ICA), M1, or M2 occlusions), severe intracranial or extracranial stenosis with concurrent acute National Institutes of Health Stroke Scale (NIHSS) scores ≥6 (luminal narrowing of 70–99% and more likely to require acute intervention due to symptomatic flow failure), intracerebral hemorrhage (ICH) ≥60 mL (more likely to decompensate and require emergent neurosurgical intervention, including hemicraniectomy, clot evacuation, and/or CSF diversion), 13–16 and large established territorial strokes (including territory of at least one major arterial division). All ELVOs were included in the definition of severe stroke because even patients with a low NIHSS score and ELVO may benefit from immediate triage to a thrombectomy capable center, given the high proportion (up to 41%) of these patients who ultimately decompensate and require immediate intervention.17 These initial surveys were driven by the pilot experience. Brain pathology that does not merit highly time sensitive triage includes acute small strokes (strokes that are not ELVOs and do not have established territorial infarcts), ICH <60 mL, tumors, established non-territorial strokes, stroke mimics, including seizure and metabolic causes, subdural hematomas, subarachnoid hemorrhages, and subjects with no pathology. Patients with intracranial implants were excluded from analysis due to hardware interference with the device recording. Scans were managed by the CRO and reviewed by a panel of stroke neurointerventionalists (one radiologist and two neurosurgeons) who were blinded to the patients’ final asymmetry scores. It should be noted that, as this was a derivation study, initial clinical presentation and early direction of asymmetry were available to the review panel. This was important, and by design, in order to allow assessment of the technology’s ability to identify, or not identify, the broad disease subtypes scanned, which is critical for a derivation study. Mean bioimpedance asymmetry (MBA) was calculated for all patients. An MBA threshold was identified to maximize the diagnostic ability of the device to differentiate subjects with severe stroke from subjects without severe stroke (as defined a priori above). Diagnostic characteristics were calculated, including sensitivity, specificity, area under the curve (AUC), positive likelihood ratio, negative likelihood ratio, positive predictive value, and negative predictive value. Diagnostic characteristics were calculated for the ability of the device to differentiate subjects qualifying for severe stroke among all strokes. Diagnostic characteristics were then calculated for the ability of the device to differentiate between subjects qualifying for severe stroke among all evaluable subjects. The NIHSS was performed by a medical professional or clinical coordinator accredited to perform the examination at the time of device evaluation on all enrolled subjects. Commonly used prehospital ELVO triage scales, including the Prehospital Acute Stroke Severity Scale (PASS), the 3 item Stroke Scale (3ISS), and the Cincinnati Prehospital Stroke Severity Scale (CinPSS), were applied on the entire test cohort and compared with the VIPS device. False negative rates and false positive rates were calculated for the accuracy of the test to diagnose subjects suffering acute brain pathology qualifying for severe stroke triage among all stroke patients. A total of 252 subjects were enrolled across the three cohorts, of whom 248 were included in this dataset (79 healthy controls, 41 subjects from the pilot study, and 128 VITAL subjects). Among the four excluded subjects, two were from the pilot cohort and two were from the VITAL cohort. Of these, two were excluded due to metallic objects in the hair and two due to device data that were corrupted. Additionally, 13 subjects, all from the VITAL cohort, were removed from data analysis due to the presence of cranial metallic hardware and/or a history of craniotomy. Therefore, 235 subjects were included in the final analyzed study population. The average age was 62 years and 45% of the subjects were men (table 1). The entire analysis included 57 subjects with brain pathology classified as severe stroke. These 57 consisted of 41 subjects with ELVO, including 25 with ICA or M1 occlusions and 16 with M2 occlusions. There were four subjects with established territorial strokes, 10 subjects with severe stenosis/near occlusion with a concomitant NIHSS score ≥6, and two subjects with ICH ≥60 mL. There were 26 subjects with small ischemic or hemorrhagic strokes, including 16 subjects with small ischemic strokes, 10 with ICH <60 mL, five with established non-territorial strokes, eight with subarachnoid hemorrhage, one with subdural hematoma, four with unruptured intracranial aneurysms, three with seizures, six with tumors, 46 with miscellaneous non-lesional pathology, and 79 un-imaged healthy controls with no related medical history. MBA for subjects qualifying for severe stroke (n=57) was 16.5% (95% CI 14.6 to 18.4) while MBA for subjects with small strokes (n=26) was 8.0% (95% CI 6.9 to 9.0) and MBA for healthy control subjects (n=79) was 5.0% (95%CI 4.5 to 5.5) (table 2). Initially, diagnostic characteristics were calculated for the device’s ability to differentiate subjects with severe stroke from subjects with small strokes. In this group, the device performed with a sensitivity of 93% (95% CI 83 to 98), specificity of 92% (95% CI 75 to 99), and an AUC of 0.93 (95% CI 0.85 to 0.97) (table 3, figure 2). Secondly, diagnostic characteristics were calculated for the device’s ability to differentiate subjects with severe stroke from all other tested subjects in the pooled analysis. In this group, the device performed with a sensitivity of 93% (95% CI 83 to 98), specificity of 87% (95% CI 81 to 92), and an AUC of 0.93 (95% CI 0.89 to 0.96) (table 3, figure 3). Receiver operating characteristic curve for the volumetric impedance phase shift spectroscopy (VIPS) device to differentiate subjects with severe stroke from subjects suffering small strokes. Receiver operating characteristic curve for the volumetric impedance phase shift spectroscopy (VIPS) device to differentiate subjects with severe stroke from all subjects. The false negative rate and false positive rate for the device’s ability to differentiate subjects with severe stroke from other subjects suffering a stroke were 7% and 8%, respectively. False negative rates for the NIHSS, PASS, 3ISS, and CinPSS were also calculated for the ability of each of these tests to differentiate subjects with severe stroke from other subjects suffering a stroke, and resulted in 21%, 21%, 25%, and 25% respectively (figure 4). 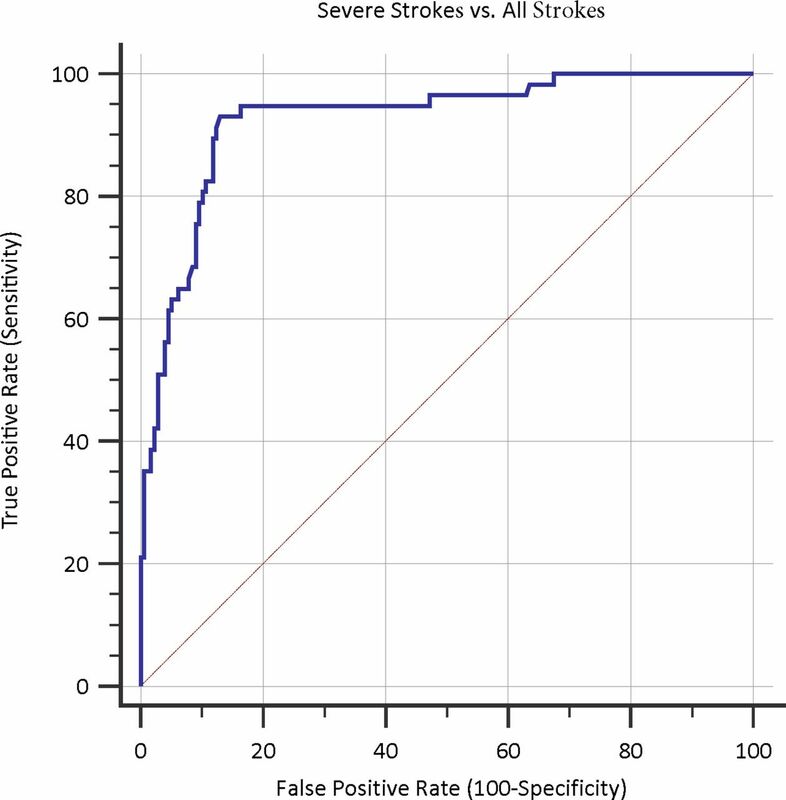 Sensitivity for these assessment tools to differentiate subjects with severe stroke from other subjects suffering a stroke were 79%, 79%, 75%, and 75%, respectively, while specificity was 71%, 75%, 63%, and 71%, respectively. Accuracy of the volumetric impedance phase shift spectroscopy (VIPS) device in differentiating severe stroke from small strokes compared with other commonly used screening tests in this study population. 3ISS, 3 Item Stroke Scale, CinPSS, Cincinnati Prehospital Stroke Severity Scale; NIHSS, National Institutes of Health Stroke Scale; PASS, Prehospital Acute Stroke Severity Scale. This study demonstrates that a novel non-invasive device can rapidly acquire physiological data that may yield high sensitivity and specificity for detection of severe stroke. Stroke treatment systems of care have been designed for the past 20 years around rapid administration of tissue plasminogen activator.18 Now with level 1a evidence in support of thrombectomy for ELVO, we are charged with the task of triaging ELVO patients to thrombectomy capable centers as accurately and quickly as possible.19 Data suggest that approximately 75% of ELVO patients are denied a chance at thrombectomy due to delays in triage.20Patients who are transferred from one hospital to another have longer revascularization times, worse Alberta Stroke Program Early CT Scores at the time of treatment, and suffer worse outcomes.7 8 The ideal diagnostic test to improve patient triage would be portable, fast, require minimal specialized training, pose no additional risks to the patient, perform in a reproducible and accurate manner, and be low cost such that it could be widely adopted in all ambulances to integrate into our current triage system. This is the first formal study evaluating a device with the potential to satisfy all of these characteristics. Multiple technologies have been proposed for stroke detection and are in various stages of prototype development and testing. Strokefinder MD100 (Medfield Diagnostics AB, Gothenburg, Sweden) is a microwave based technology made to fit on a stretcher and designed to detect intracranial hemorrhage. The device was used to differentiate patients with chronic subdural hematomas from healthy controls with a sensitivity of 100% and specificity of 75%.41 42 Transcranial Doppler based technology is also under investigation. Results of a pilot study performed by Neural Analytics (Los Angeles, California, USA) were presented as an abstract at the 26th European Stroke Conference, Berlin, May 2017, demonstrating sensitivity of 100%, specificity of 86%, and AUC of 0.96, differentiating 17 patients with CT angiography confirmed ELVO from 28 healthy controls.43 Data using the Neural Analytics Lucid System were presented at the 2017 Society of Vascular and Interventional Neurologists. The authors reported 91% sensitivity, 85% specificity, and AUC of 0.94 in diagnosing ELVO among patients suspected of having a stroke. There are other start-up companies evaluating ultrasound, brain oxygenation asymmetry, and other technologies for prehospital diagnosis but these companies have not published data to date. This study has evaluated the VIPS device in a pooled analysis, including a healthy cohort, patients presenting as stroke codes to a CSC emergency department, and patients presenting with a wide range of brain pathology to multiple CSCs. These data permitted derivation of basic diagnostic parameters for the device in these patient populations. Future testing is necessary to validate this device as a diagnostic tool in specific patient populations and settings. 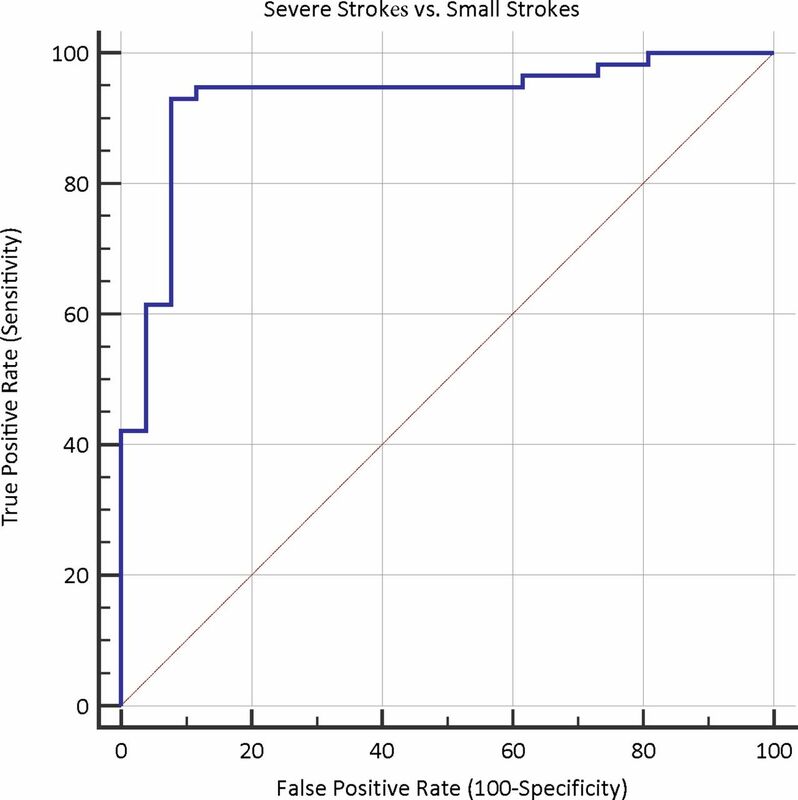 With such a high diagnostic accuracy for severe stroke, other potential settings where triage is necessary might include locations with people at a higher than usual risk for stroke, such as nursing homes, in operations with increased stroke risk such as cardiothoracic surgery or carotid endarterectomy, and settings removed from standard medical care, such as cruise ships, flights, and third world settings where neuroimaging is not readily available. As this study demonstrated, there is some variability, even in the healthy population. Attaining a pre-stroke baseline on an individual would improve the sensitivity and specificity of the device even further if a severe stroke were to occur in that individual and the device were used. In its early iteration, the future cost of this device is not known but will be an important factor in determining its ability to be adopted in multiple clinical settings. In addition, while the device has been calibrated to diagnose pathology likely requiring severe stroke triage, it is possible to vary device parameters to focus on different intracranial pathologies, widening the applicability of the technology beyond stroke triage. Certain important limitations should be considered in interpreting and applying the results of this study. First, this analysis pooled data from three cohorts with different selection criteria in order to obtain a broad range of potential brain conditions and thereby serve as a survey of the device’s response to various brain pathologies. The populations from each individual center were small, and certain subsets of brain pathology may have been more heavily represented by chance. It should also be emphasized that this was a derivation study, with the data being maximized to create the selection algorithm. Validation of these results is necessary, particularly in the specific settings where this device might be used. Second, although a committee of stroke interventionalists agreed preemptively on brain pathology requiring severe stroke triage, thereby designating those with and without ‘severe stroke,’ some disagreement about which acute brain pathologies should be included on this list is inevitable and these definitions may continue to evolve. Third, the technology relies on the ability of the device to send and receive radio waves which can be modified by intracranial or extracranial metallic implants, such as titanium plates and screws or metallic hair extensions. Additional testing will be required to determine the applicability of this device in populations with metallic cranial implants. Lastly, while the VIPS algorithm was determined by independent machine learning and while this study is, by design, a derivation study wherein independent blinded verification of results on a novel population is not the desired method or result, it should be noted that the imaging review was supported by Cerebrotech through paid consultants who have a financial relationship with Cerebrotech. The resultant machine learning output and threshold derived from the data generated by their review was not available to them during their review, but it is important to consider that these contributors’ financial relationships may have indirectly affected the study outcome in an unanticipated way, despite the ultimate threshold and algorithm being determined independently. 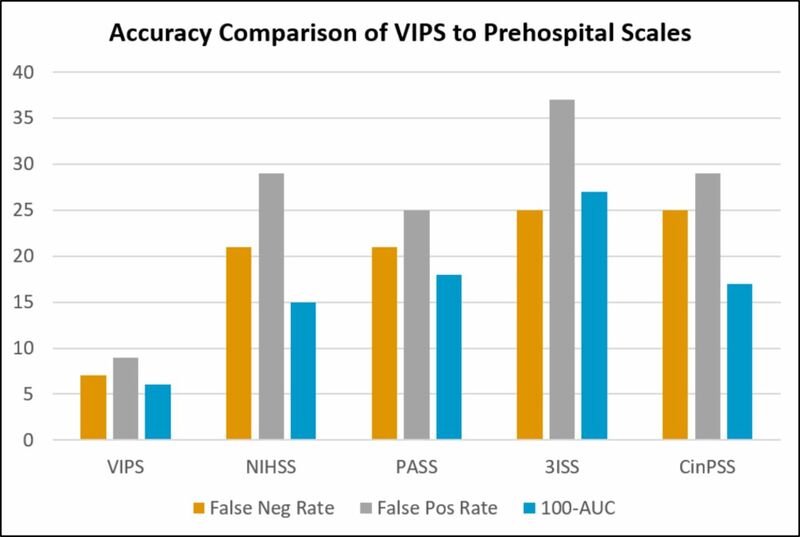 Evaluation in a multicenter clinical derivation study has demonstrated that the VIPS device appears to accurately diagnose patients requiring severe stroke triage, including patients suffering from ELVO. The VIPS device is a portable, non-invasive, and easy to use tool that may aid in the detection of severe stroke, including ELVO, with a sensitivity of 93% and specificity of 92% in this derivation study. Additional validation studies are necessary to confirm these findings in specific patient populations and medical settings.
. Interhospital transfer prior to thrombectomy is associated with delayed treatment and worse outcome in the STRATIS registry. Circulation (accessed 24 Sep 2017).
. The ICH Score. Stroke 2001;32:891–7. European Stroke Conference. 26th Conference, Berlin, Germany, 24-26 May 2017: Abstract e-Book. Cerebrovasc Dis 2017;43. Contributors CPK, ASA, RDT, and AA participated in the study concept and design. CPK, ES, KS, and RDT participated in data collection. CPK, ASA, and AA contributed to data analysis and interpretation. CPK drafted the manuscript. KMF, ASA, and AA performed the critical revisions, and all authors provided final approval of the submitted manuscript and revisions. Funding This study was funded by Cerebrotech Medical Systems. Competing interests Adam Arthur has financial interest in Cerebrotech Medical Systems. Ethics approval The study was approved by the institutional review board at each medical center.